Día de los Muertos (Day of the Dead) is an integral part of the cultural and artistic landscape of Los Angeles. Today’s interpretation of the sacred indigenous tradition has been remixed and recycled into a commercial holiday blending Mexican, Latino, and American pop culture iconography with the spiritual aesthetics of the event’s indigenous and Catholic influences. 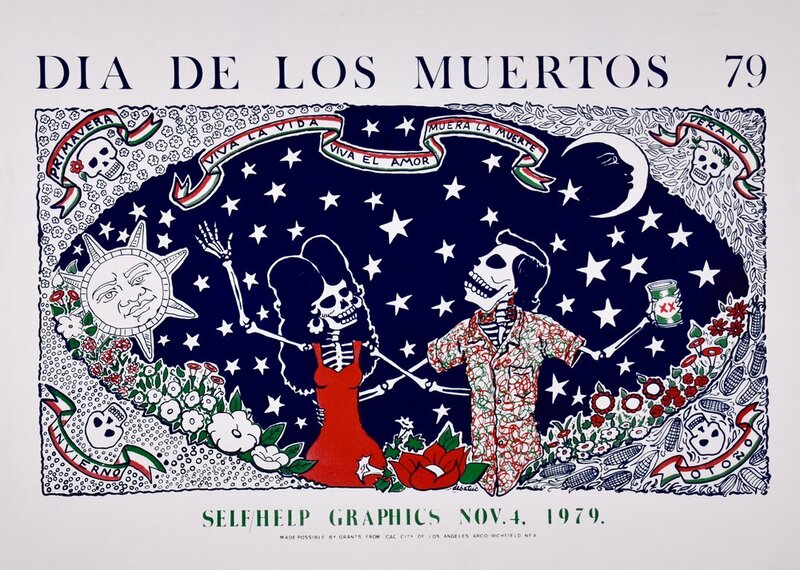 Self Help Graphics (SHG) will trace the evolution of Día de los Muertos in Los Angeles and beyond through an exhibition and publication documenting its four-decade history of art, ritual, and celebration. Since 1972, when SHG organized its first public ritual for Día de los Muertos, its annual commemoration has developed into a complex and unique public observance. Día de los Muertos, A Cultural Legacy: Past, Present, and Future will include historical prints, photographs, and ephemera representing each decade of SHG’s commemorations, as well as three newly commissioned altars from artists Ofelia Esparza (Los Angeles), Gerardo “Acamonchi” Yépiz (Tijuana), and Marcus Kuiland-Nazario (Los Angeles).